Greetings in the day of Thor ... the Thurs-day, the day of Jupiter ... the day of Zeus ... the day of the Royal King. And in the day of Thursday ... Jupiter, the planet send its Royal Blue essence to each one of us ... This essence or Energy enter in the index finger ... right and left ... and push us ... inviting us to be Kings. Francis Bacon was a King and still he is. Now, The Face of Francis Bacon who was then Le Comte de Saint Germain in France and Europe ... is now in the Heavens. It is Our Sacred Covenant ... to study and understand his immense labor and efforts. It is important because so doing we unlock Human Story ... In fact he was Plato in Greece ... King Solomon ... Merlin at Camelot ... Thoth in Egypt after Atlantis but also Osiris with Isis who was Mother Mary, and Horus was Lord Jesus ... and then they back like Joseph, Mary and Jesus. However, in this editing and second print (Second Edition) I will speak about the Shakespearean Plays ... and the Bible. Saint Germain say that he explains the method to transform Carbon in Gold ... and before you begin to wonder let me draw in your mind ... a miserable man ... lost ... not necessarily Rich ... not necessarily Poor ... but Lost ... and a transformed man ... a King. This is a SERIOUS MATTER ... because more or less, the World swim in Misery ... and if you count Rich people ... very Rich ... they are about 2000 ... the rest in India, Africa and the Americas, as well China does not live Wealthy. 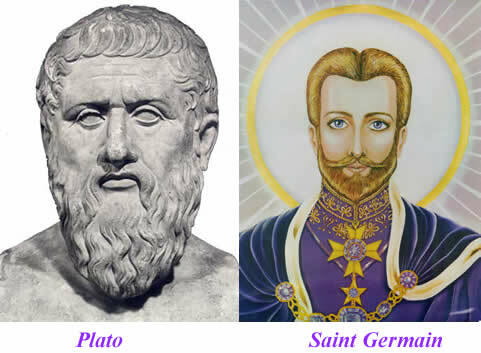 Alchemy is to transform Man in Christ and therefore a King and therefore Rich, Wise, Beauty and Wealthy ... but like Jude or Barabbas ... neither like Pilate or Caesar ... but like Jesus the Christ ... like Saint Germain, like Mother Mary, or the Saint of Saints, Mary Magdalene. The Saint Germain statement was ... 'A Garden is not created by the Love ... but by the Magic of the Effort and the Transformation'. -- Much Ado about Nothing. 46And about the ninth hour Jesus cried with a loud voice, saying, Eli, Eli, lama sabachthani? that is to say, My God, my God, why hast thou forsaken me? But this is FALSE ... This is an UNSACRED LIE ... changed by the Serpents that rules the World ... to give no Option, no alternative in God. In fact, if God fail ... Who would you look for ? ... Evil ? ... If a woman fail ... Who will look the man for? ... The man will look for the Prostitute? ... and if the Prostitute fail .. the man will look for a boyfriend ... and in most cases suppose the Homosexual relations are fair. Do you want to know what were 'Jesus words ... ?' ... Jesus say, "Father! how thou hast glorified me". Many or most of the Darkness in the World is provocated, created and maintained ... feed by Illusions. Because this BAD DRAW ... This FALSE DRAW ... Manipulated Picture ... in Religions that was expected to be 'The Best' ... we got 'The Beast'. In fact, we have 'Beasts' in my many religious ... They are applauded and loved ... nurtured. I Giovanni (John) do not know if some father or mother will kiss the hands of the Priests that violate their children and say 'Please dear Priest Violate again my children' ... Probably not. Therefore in these days of lawlessness on all sides ... books like 'Shakespeare and the Bible' are a forte rock to have. Both books (Shakespeare and the Bible) presents important insights ... in fact, no one will tell to me ... that the Shakespearian Plays are not 'The New Holy Word' ... like a New Holy Bible updated. I consider that Francis Bacon ... find (like me, Giovanni by the way) ... the books a straightforward system to tell the truth, that he devise using a code, the Shakespearian Code. §1. The sleep of a labouring man is sweet, whether he eat little or much; but the abundance of the rich will not suffer him to sleep. —Cymbeline, Act 3, Scene 6. §2. A good name is rather to be chosen than great riches, and loving favor rather than silver and gold. Is the immediate jewel of their souls. —Othello, Act 3, Scene 3. §3. It is more blessed to give than to receive. —Merchant of Venice, Act. 4, Scene 1. Therefore my friends ... not only we need A NEW RE-STRUCTURATION of Religious studies to find ... ALL THE FALSITIES dispatched for Truth ... In fact, I modestly consider that also 'The Book of Revelations' has been modified. However, let us ... walk-in in the Future and leave the Heavy Potatoes of Anger and Vengance. Let them ... walk Light. —Coriolanus, Act 2, Scene I.
I hope no one feel offended.